The sample reflects salaried (nonhourly) workers who are subject to the Fair Labor Standards Act (FLSA). This excludes certain groups of workers such as the self-employed, most federal workers, religious workers, many agricultural workers, and many transportation workers. As the figure above shows, only 2.8 million salaried women earn less than the current overtime salary threshold of $23,660. 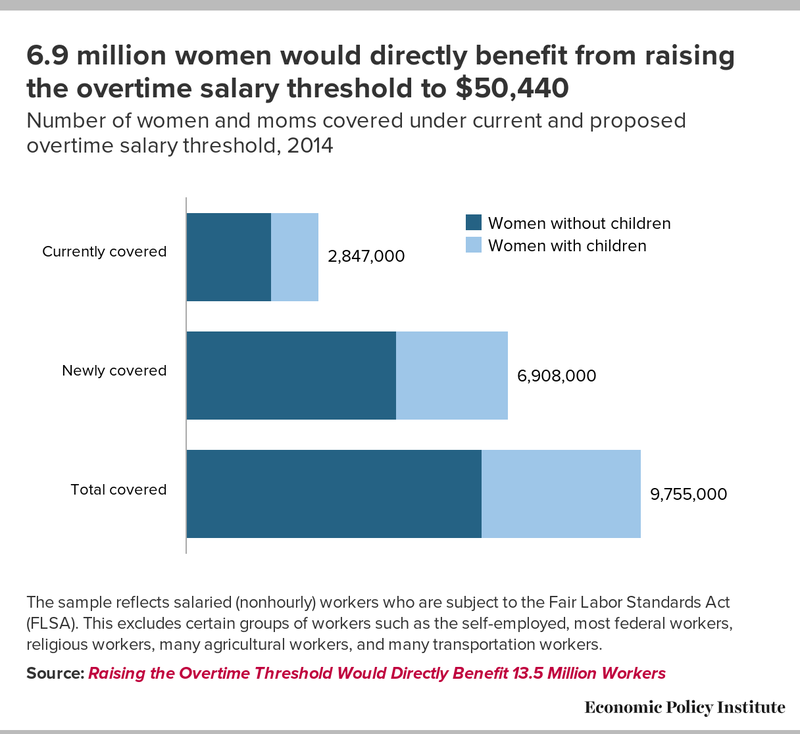 Under the new rule, an additional 6.9 million women will have automatic overtime pay coverage, including 2.4 million women with children under the age of 18. Raising the overtime salary threshold to $50,440 will bring the total number of women eligible for overtime based on their salary alone to 9.8 million (or nearly 40 percent of the entire salaried female workforce). More than one-third of these women (3.4 million, or 13 percent of the entire salaried female workforce) have children. Raising the overtime salary threshold to $50,440 in 2016 will directly benefit women by protecting their right to a limited work week and requiring that they be paid a premium for every extra hour they work beyond 40 hours in a week. This new rule will give some women higher pay for working overtime and others reduced hours without any reduction in pay. Additionally, it will benefit millions of women by giving them more time for commuting, community, family, and friends.